On first impressions: When we walked in, the house immediately crossed off everything on my list. I was looking for a house that had character and history. It was built by R. Harold Zook, a well-known Chicago architect, in the 1940s. I loved the natural light and the hardwood floors. It doesn’t have a dishwasher, and I spend a lot of time hand washing dishes, but it’s worth it. Couch: Article. Rug: West Elm. Glass terrarium: Target. Flower art: photo by Ro Birkey, frame by Framebridge. Couch pillow: Maewoven. On nicer sofas: We never put much thought into sofas because we figured the kids would mess them up. 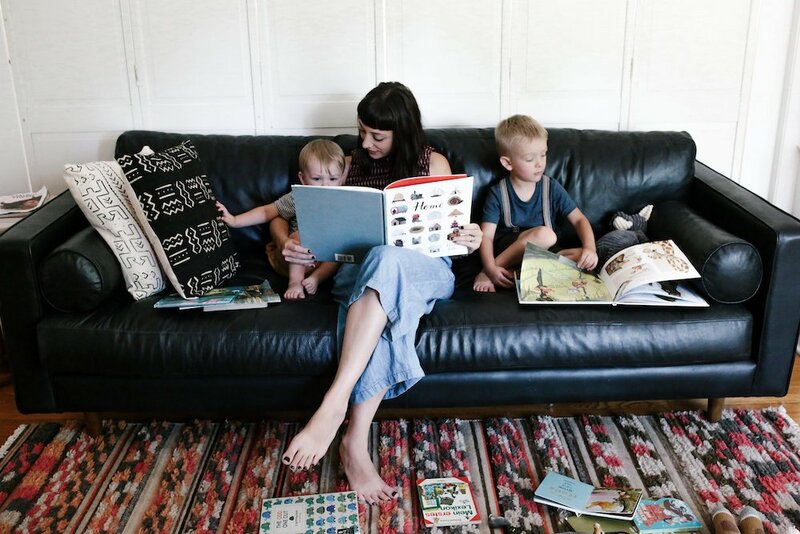 But then we got a leather one, which I call our “grown-up couch.” Leather is actually great for kids — it’s durable and comfy. It’s become a centerpiece in our home. We read together, and it’s my place to binge on Netflix after the boys go to sleep. I just finished Stranger Things and loved it like everybody, and now I’m going through Parks and Recreation for the second time. It’s how I unwind. 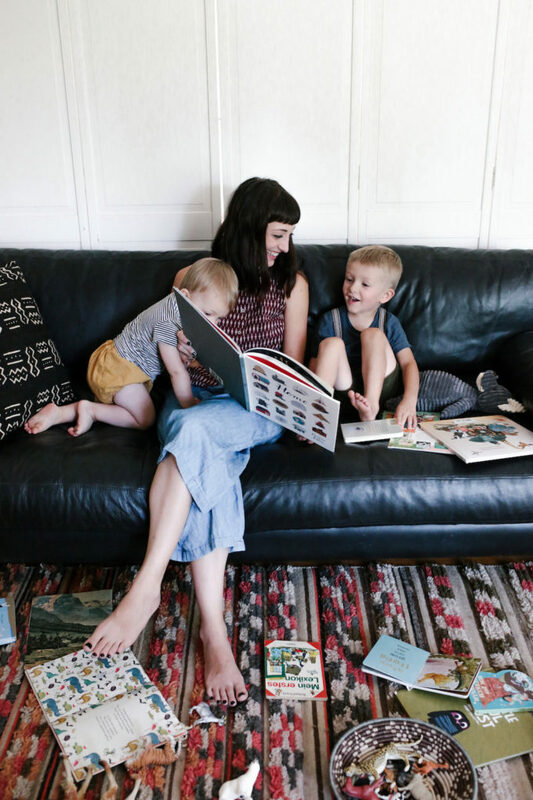 On reading together: We love to read as a family. We get a stack of books, and the four of us sit together before bed. Cohen is really into superheroes right now, so we have a bunch of Batman books and things like Even Superheroes Have to Sleep. Ames loves My First Book of Sounds. Basket: HomeGoods. Chair: Article. 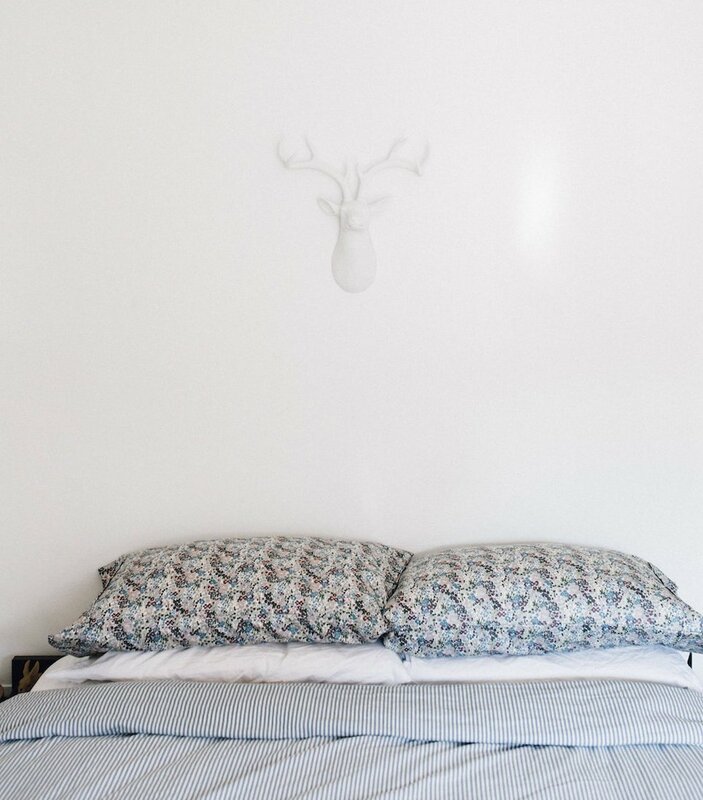 Throw: Land of Nod. Tripod floor lamp: Target. “War is Over” art: Imagine Peace. Credenza: Walker Edison Furniture Company. On little reminders: Some people like to have lots of pictures around the house. For me, I think showing different writing is beautiful. Since I’m the one home with the boys all day, seeing familiar words on the walls everywhere helps me feel good. 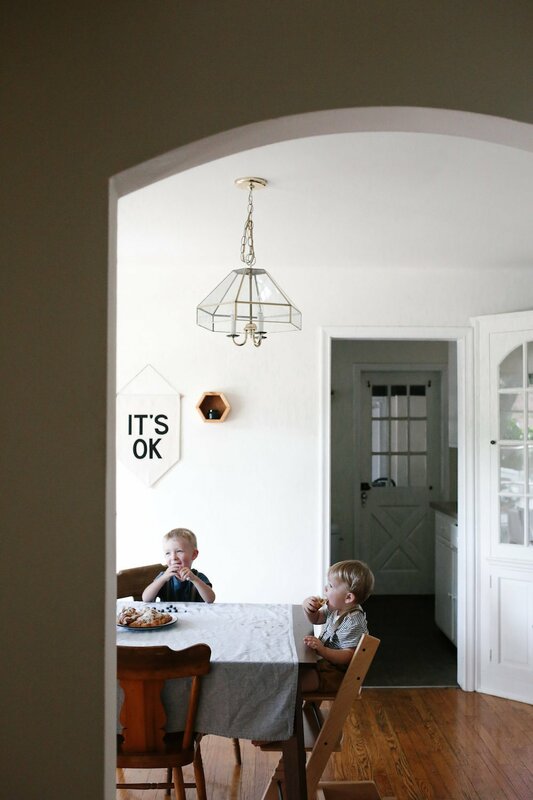 As corny as “It’s OK” [hung in the dining room, below] might be, it’s a great little reminder when I am having a hard day, and for the boys, too. 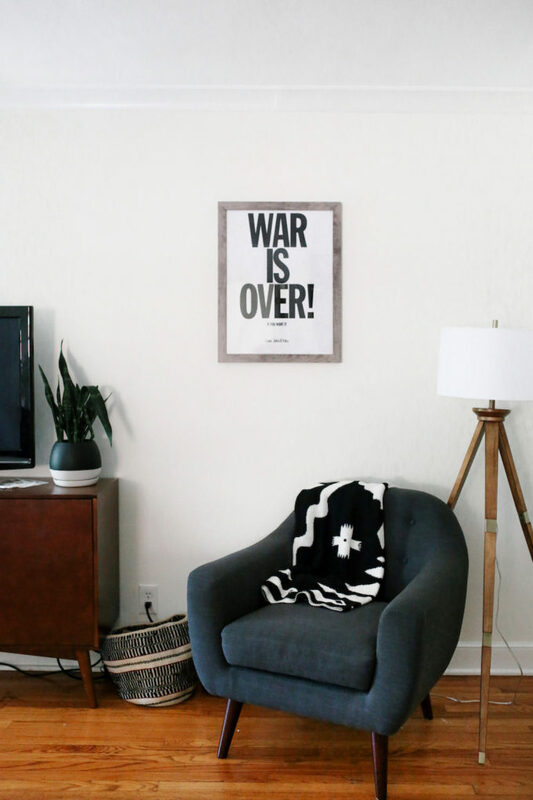 “The War is Over” is a John Lennon and Yoko Ono print, that says underneath in tiny letters “If You Want it.” It’s a little deeper than my other ones, but everything that is going on in the world right now really upsets me. This is my reminder to be a kind, thoughtful human and to know everything starts with us. Dish rack: Target. Planter set: Urban Outfitters. On small kitchens: We painted the walls in the kitchen off-white, so the white cabinets stand out just a little bit. It’s the smallest kitchen we’ve ever had, so we figured white paint would open it up and make it feel as big as possible. 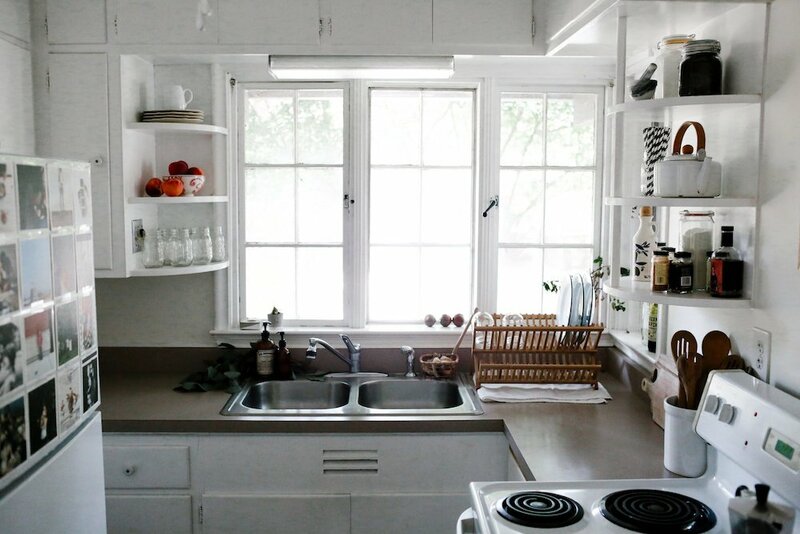 A white kitchen also feels bright and clean, even if there are some dishes piled up (which there usually are). Quote board: Letterfolk. Espresso maker: Target . 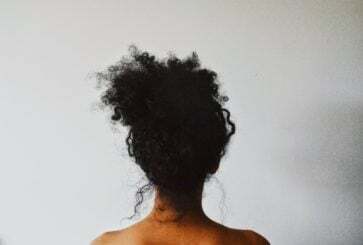 On letting go: I have come to a point in my life where I realize I don’t have to hoard everything. Not that I was a hoarder, but I grew up without a ton of money, so I held onto a lot of things because that’s all I had. Since becoming an adult, I have realized that it’s okay to get rid of things if you’re not using them. 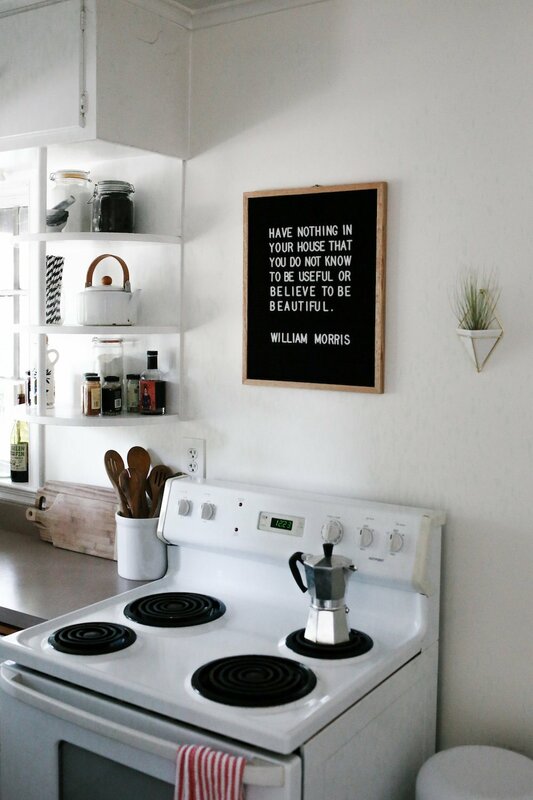 We try to be purposeful with everything we bring in our house, so this quote exemplifies our way of living now. On switching things up: You can change the writing on the quote board to say whatever you want. This one has been there for over a month, and I think it might have been the longest we’ve kept one up. I get bored easily, I like to switch things up. I move furniture and art around about once every six months, but there is only so much I can do with a small house! 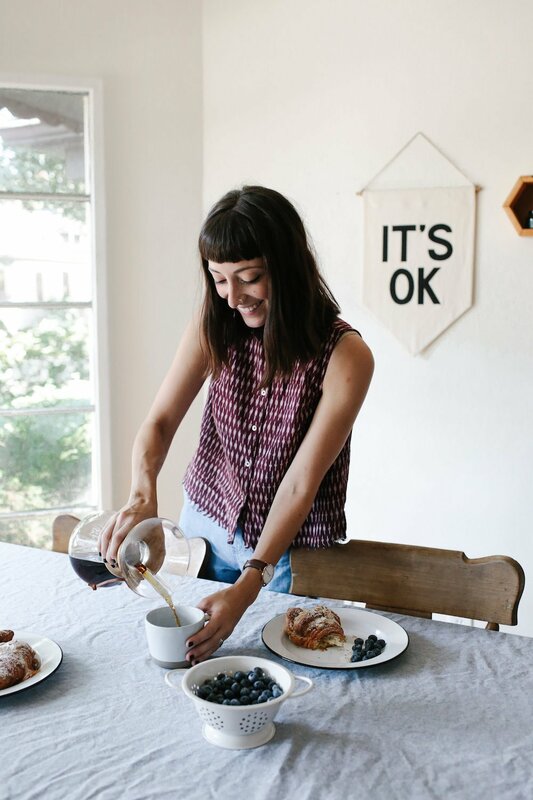 “It’s Ok” banner: Secret Holiday & Co. Geometric wood wall hanging: The Little Movement Shop. 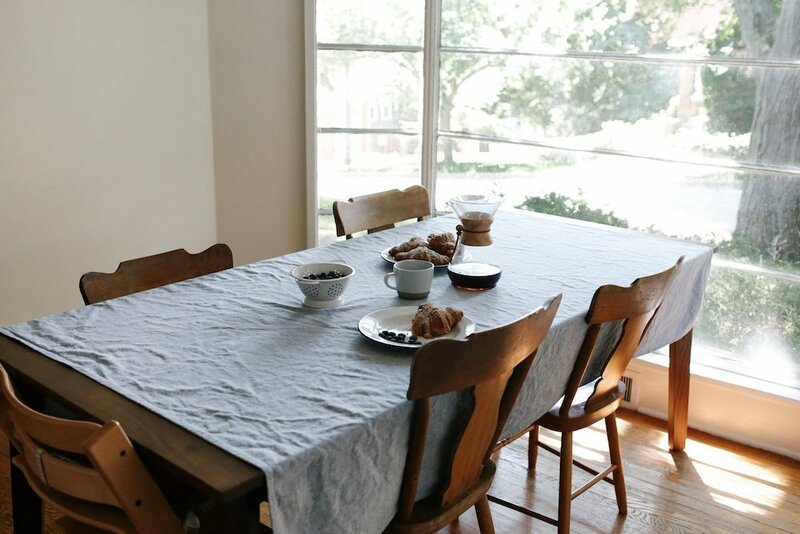 Table: Hedge House Furniture. Chairs: family heirloom. Table cloth: Target. Chandeliers: original to home. On cooking: We love trying new things. Some recipes stick, and some we’re like, “All right, not doing that again.” On the weekend, we all cook together. It gets tight in the kitchen, so we use the butcher’s block in the dining room for extra counter space. Our favorites are chicken tikka masala and shredded chicken tacos. They’re spicy, so the boys usually eat it without the salsa, but I always put it on the side so they have the opportunity to try it if they want. I’m not a restaurant, I’m not going to make four different meals, and this way they end up trying things they normally wouldn’t try. My younger son is a dump truck and will eat anything, but Cohen hates anything green. Still, I’ve just keep putting veggies on his plate. A couple times recently he has taken bites, so progress! On eating together: We sit down together every night for dinner. It gives a chance for us to talk about our days. 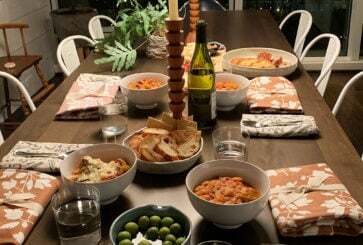 Even if it gets crazy at bedtime, at least we had that moment of hanging out together around the table and sharing a meal. Circle mirror: Target. Butcher’s block: IKEA. Tea towel: Crate & Barrel. On statement walls: Since most of the walls in the house are neutral, I wanted a statement wall to liven up the dining room. 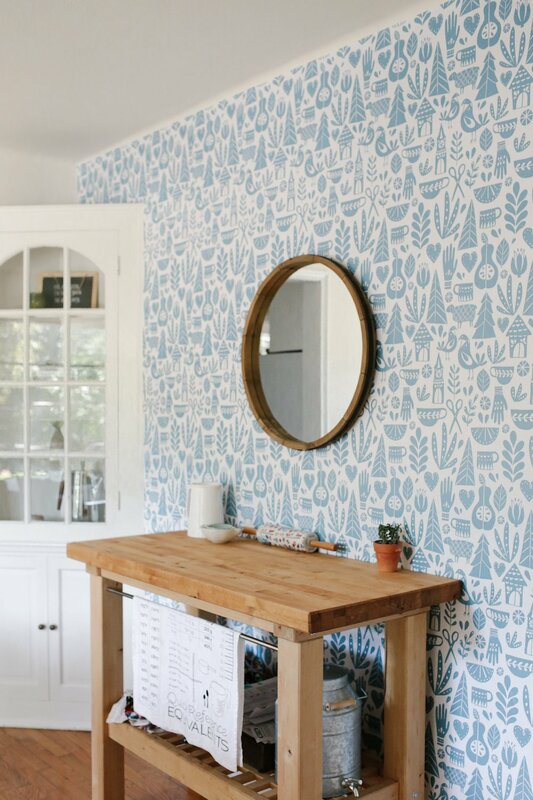 I had heard of the company Chasing Paper, which does stick-on wallpaper, but no print caught my eye until I saw this one. It’s kinda folksy. The color is just right, too. I didn’t want it to be too crazy, because it’s our dining room. On special drinks: Mixology is one of Noel’s creative outlets, so we like having friends over for cocktails. When it’s just us, we make margaritas on the rocks with fresh lime. A fresh margarita at the end of the day is so refreshing — we always have limes on hand! We have that or a beer — Noel is a beer snob, so I know whatever he puts in the fridge is going to be good. Crib: IKEA. Rug: Land of Nod. Treehouse play set: Land of Nod. 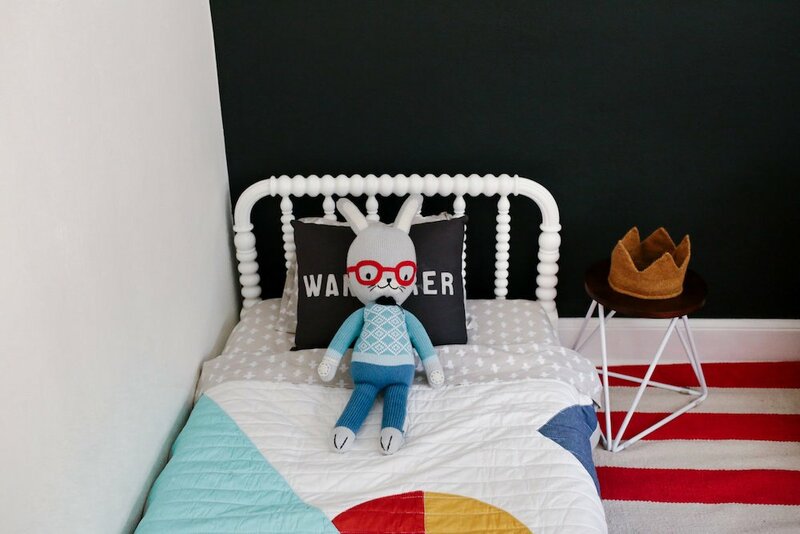 On making things playful: Most of our house is neutral with pops of color here and there. But for the kid’s room, I decided to push myself out of my comfort zone. I wanted it to be more playful for them. The kids spend most of their time in there, and it’s a nice place for us all to hang out. Bed: Land of Nod. Wanderer pillow: Land of Nod. Toddler sheet set: Land of Nod. Stuffed bunny: Cuddle and Kind. 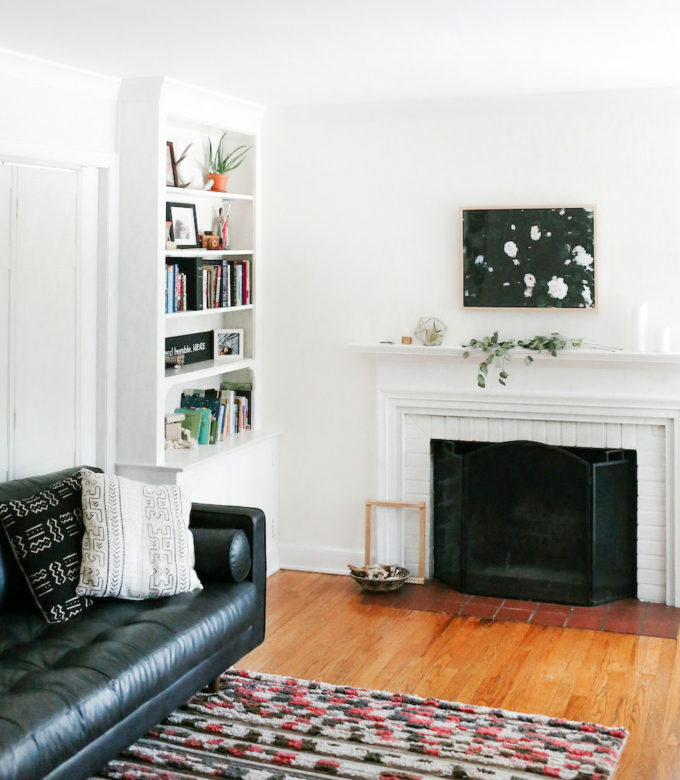 On fun patterns: Since it’s a small room, we figured a large rug would make it feel bigger. I decided to go for color with this one. 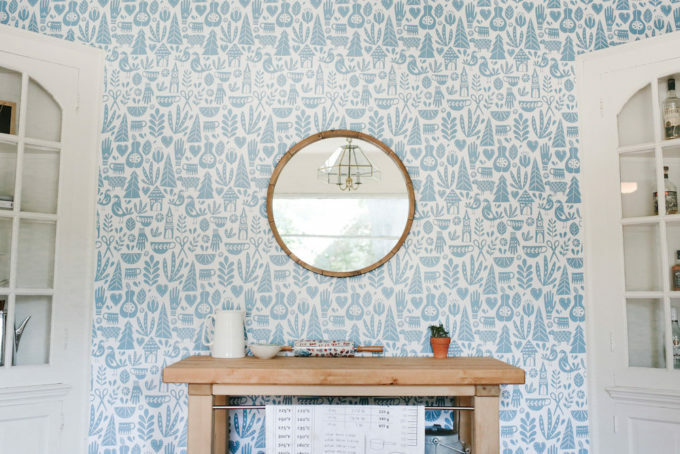 I love all the fun patterns in the room. At first, I didn’t know if the octopus crib sheets would go, but I went for it — now they’re my favorite thing in the room. Theirs is the train set! On choosing names: We obviously like the last-name-as-a-first-name thing! If a stranger asks how we chose the name “Cohen,” I’ll just say we liked it. But if it’s a friend, I’ll admit that it’s from The O.C. When that show was on, I was obsessed with Seth Cohen. On dance parties: We have little dance parties in the house throughout the day. When everyone is in a funk, it helps to get the kids to move around and not take things too seriously — for me, too. Cohen’s usually opposed to it at first and then he breaks a smile. He’s my “three-nager.” He’s over it most days and already totally embarrassed by me. It’s a phase three-year-olds seem to go through — they think they’re right about everything and are very independent. 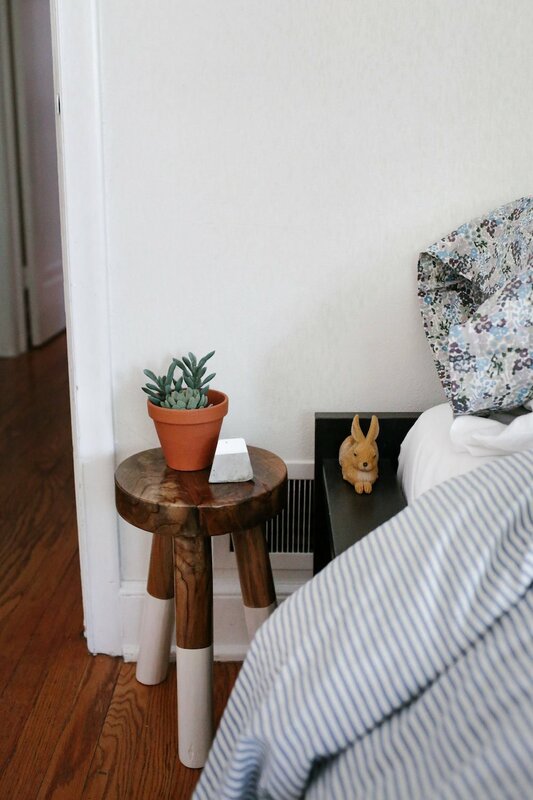 On having a calm bedroom: We wanted our bedroom to be a place we could relax. 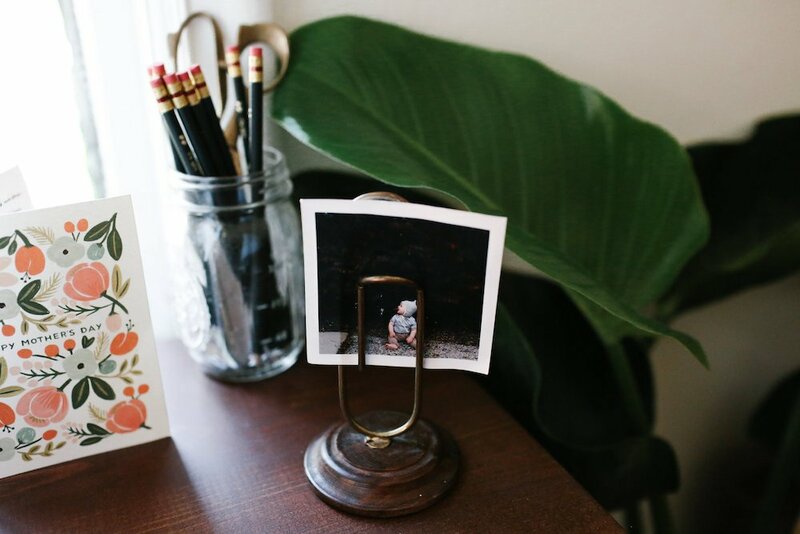 In previous places, we’ve had a lot going on in our bedroom, but having a bunch of stuff around made me feel a little anxious. At the end of the day, it’s nice to just be somewhere clean and simple. Wall sculpture: Target. Bedside table: Serena & Lily. On staying put: We have lived in five different places since we got married five years ago, but do not want to continue this moving trend. None of our homes felt like a place we could stay awhile — until this one. I wanted a house that felt like a home. We’ve finally found that, and it feels really good. Thank you so much, Ro! P.S. 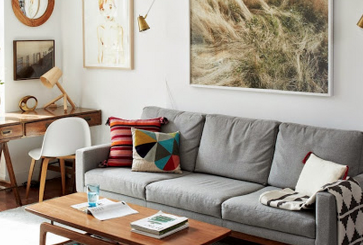 More house tours, including a San Francisco home and a Manhattan apartment. Love what you’re doing with the place. My husband and I just moved to Rogers Park in Chicago with our 5 kids. Bought an old beauty built in 1893. Needs a ton of work and I’m inspired by your place all over again. Wow! What an amazing adventure. That home I’m sure has so much love and charm! Thanks for the sweet words ? I lived in naperville 22 years ago (i’m german and was working as an au pair) in a neighborhood called knock knolls. Such good memories, i loved downtown! Your house looks so beautiful and charming! Thanks for sharing. That’s incredible! I love how much the downtown is evolving these days. Such a fun place to be! Thank you for your kind words!! They have held up amazingly!! We have two young, very active boys who put it to the test all day everyday. It’s so comfortable and also durable. The chair is our favorite place to read. Very comfortable as well! Both products are very well made. What a lovely home! I grew up in Naperville and can picture your neighborhood (or similar). Great town. Thanks for sharing! I love it when you do home tours and they are always lovely, but I have noticed they often fall in the same tone? I’d love to see a variety of interior styles with these features. we actually are trying really hard to do that. i hope it’s coming through! we’ll definitely keep trying. I’m really interested in where Ro found the giant stitch blanket and also the pillow cases on her bed. I love this post. I have those pillowcases/sheets too! They are from Target, over a year ago. Yes! Odd one Out. It’s so great, my oldest loves it! I just adore the simplicity of the space. my grandparents lived in naperville, and i have very fond memories of fireflies during the summer and making snowmen in the winter (CA born and bred!) and the distinct smell of their basement (but nowhere near as stylish memories! ;) ). lovely home! Such a beautiful well-curated home! You have such a good taste, Ro. May I ask where you obtained the wooden toy house from? It is so charming! Love the house and soooo excited to see a home in my own town!!! Love this decor style! The architecture is gorgeous, and unlike so many home tours I come across on the internet, this looks like a home that people really live in. Do you happen to remember what whites you used for the walls and trim? It is pretty perfect. 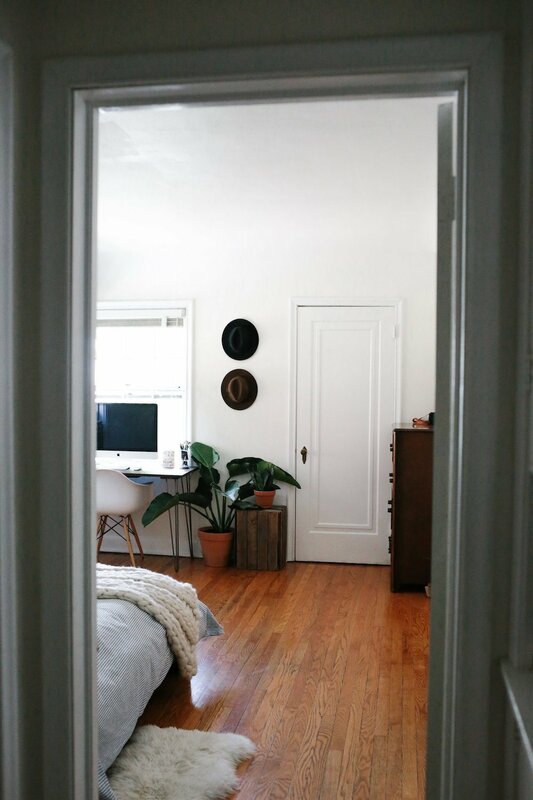 I’m at the point where, while I like color, I have accepted that white rooms make me feel calm and am ready to do the whole house, not just a few rooms here and there. I am become paralyzed by the sheer choice of different combinations of whites. Wait wait wait – it’s never been uncool to be a Beatles fan, right!? I had an ex who shamed me for liking the Beatles still. Probably why he’s an ex. ;) haha Love the Beatles!!! such a lovely charming home. love the character of older houses and you can tell this one is filled with happy people! I really like how you have your dining table set up. 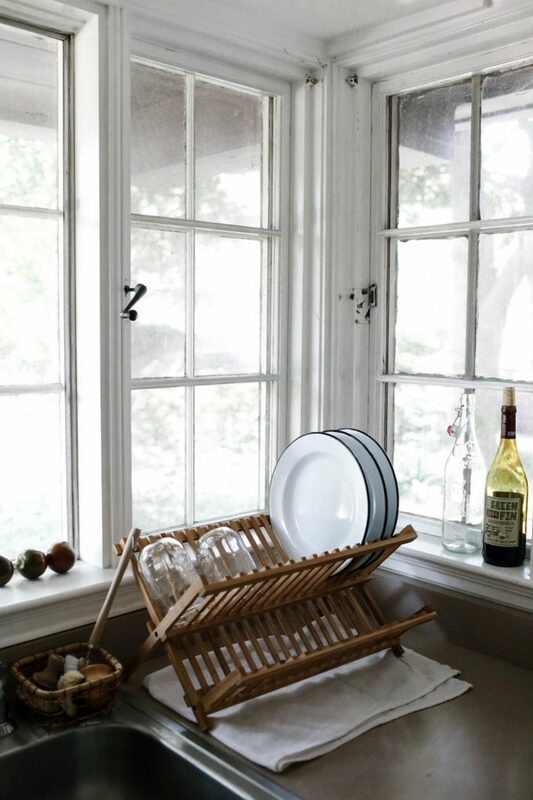 We have a big window like this in our dining area (with a beautiful view), but right now the grown-ups get to look out and the kids have their back to it…maybe we’ll turn it 90 degrees and see what happens! What a lovely soul! Her home seems to be such a beautiful expression of themselves. Lovely home and this couple sounds like I would love to have them as friends. Alas, I live in France though. 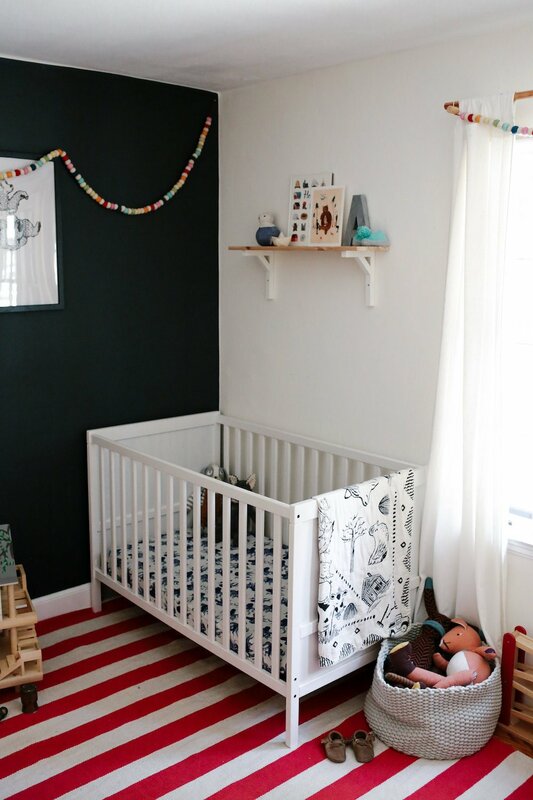 I am also interested in the print in kids’ room, black print on white paper. Home made? What is it, a lyric or poem? It is a lovely home, thank you for this nice series. I don’t know anyone who does not love Target and Ikea but the trick is combining the right things w white walls and cool art. What a fun and personalized home!! Who made the “united in marriage” framed embroidery? It’s lovely!!! My friends mom, she’s so talented!! What a beautiful home! So many personal yet stylish touches. 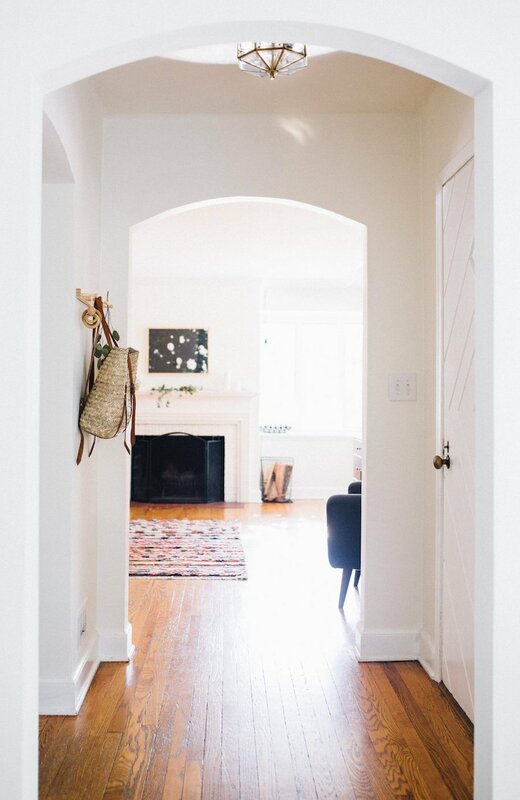 I can feel the calm, clean vibe of your home through the photos. It’s so lovely and I love seeing the beautiful home decor pieces you’ve found at lots of accessible stores. Thanks for the tour! Would you be able to please share where you found the top you’re wearing in these photos, Ro? It’s beautiful! This house is so beautiful! And the family looks so happy to live there! We’re in love with it, and so happy to be here. :) Thanks for your sweet words! You have such a sweet house, Ro. We have many of the same house goals – cozy, simple, not a lot of stuff. Oh what a beautiful house!! I love love love the windows, the subdued colors and the beautiful simplicity of it all. It feels like one of those homes you’d enter and immediately feel comfortable and welcome. I totally loved the HOME! love this. Love the lennon poster. Much needed reminder these days. Agreed! I saw it and knew I had to have it in our home. I adore that wall paper!!! It’s from Chasingpaper.com. They have the best removable wallpaper, perfect for renters! I do like a tiny kitchen. Bit over the huge sprawling idea with everybody underfoot. Also: I am not a restaurant. Too right. This is the way to get them to eat sensibly. It’s the smallest we’ve had yet, but I still love it. :) And yes, we have found the best way for our boys to be exposed to lots of different foods is to offer it daily, during dinner time. Otherwise they wouldve never tried it and missed out on some of their *now* favorite foods! I’ve been to Naperville! That’s only even remotely note-worthy because I’m a Brit and Naperville is hardly the first stop on the tourist trail! SUCH a great little town. Gorgeous house :-). 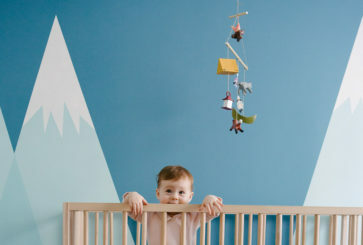 Love that Land of Nod treehouse! Sometimes I play with it more than my kids do! Beautiful home! This is an aside, but I love the shortened name, “Ro.” Does anyone know what it stands for ? My guess in this case is Robyn – there is a beautiful cross stitch sampler in one of the photos (about 5 down) recording the marriage of Robyn Alicia Peterson and Noel Christian Birkey. But I also have a friend Ro – short for Rowena. the embroidered piece on the shelf said robyn. It appears to be short for Robyn (from the embroidered heart on the bookshelf picture), I also love the shortened name Ro, it feels very clean and cool! Shout-out to the Chicago burbs! Lovely home. Especially love the dining room wallpaper and the kids’ room. So cute! Also, I like your book collection ;). I love seeing the insides of people’s homes and their lives within it! Loved this post. Love seeing Ro’s home on here! Yay Ro! Naperville is such a great town – I spent many years living in Wheaton, the next town over. This beautiful! I love the huge knitted throw in the master bedroom. I’m dreaming of making one of those some day! Love this house! Very approachable:) would love to see more house tours like this one. I have the caramel version of that sofa and love it. What a beautiful home! It looks custom, but I’m obsessed with that dollhouse? Can you tell us more? It’s actually from The Land of Nod! Still available to purchase in the store or online. 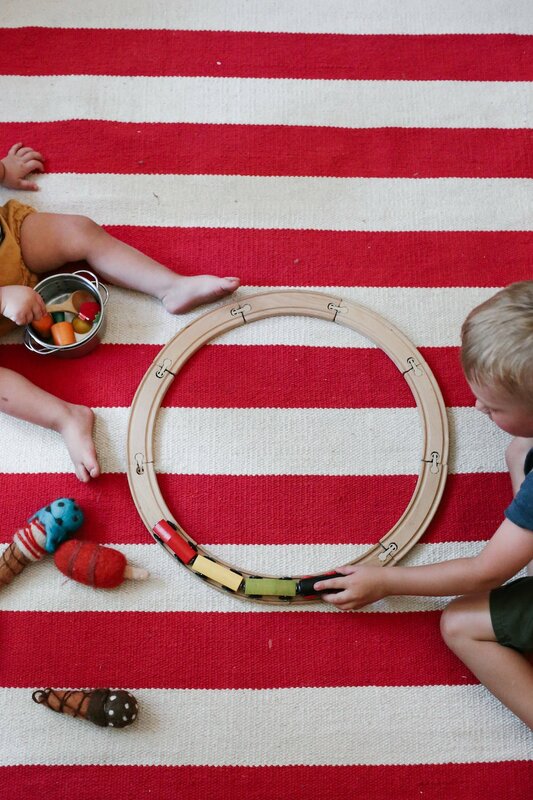 The boys play with it everyday and I love having it in the living room most days because it’s so cute! The rest of the house is lovely, too! Ha – Seth Cohen. Always thought the fact that he gave out “Seth Cohen starter packs” to new girlfriends was so funny. Love the large windows in her house. So in love with this house! Lovely home! I am especially taken by the adorable wallpaper in the dining room and the clean fresh kitchen! I am always impressed when families with small children have such clean and fresh looking homes. I am sure this is the cleanest their house has ever looked, but it just looks so impressive! Althlough we have a blended family of 4 girls, 18, 16, 2 and 7mo and I will say without a doubt the teenage are the mess makers of the house! I loved reading through this – love the place, instantly warmed to it! 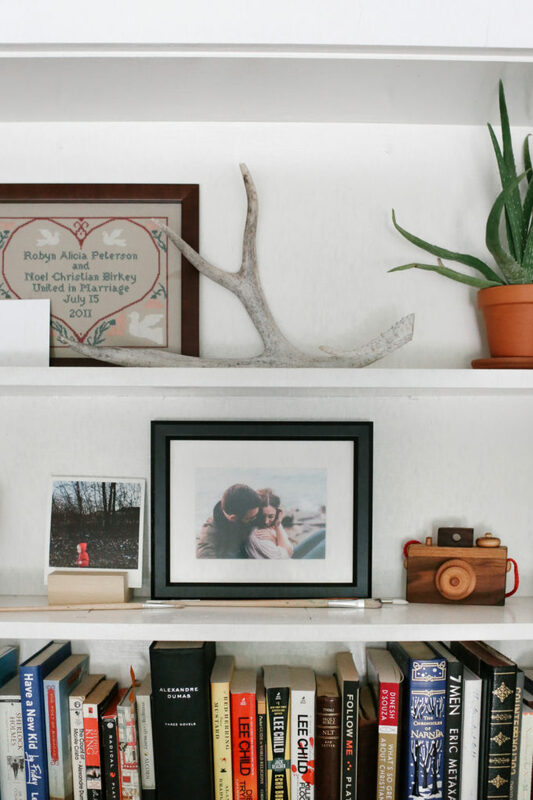 I lived in the Midwest for a few years and the unpretentious and simplicity of the home decorating is still my fave :) This is a lovely home that looks like a lot of love happens there! Love seeing your house here Ro! Very lovely home. I love the warmth and simplicity. I love hanging quotes too! I totally agree with this. I’d rather have a full tummy and a calm dinnertime. Usually what they want is so simple. A wise woman who happened to be the long-time director of a play-based daycare once told me, it doesn’t matter, they can have mac n cheese for every meal and they will still be OK. While I want them to eat more than that and to enjoy food, it made me feel calmer about the whole thing :) I also had a chef from a children’s hospital calm me about it, he said enjoy that they are healthy, let them have their freedom. It really put things into perspective. Some kids aren’t all that picky and you can easily get them to eat most of a normal family meal without a “food war.” Not every kid does the whole “only mac and cheese or nuggets for a year” thing. I’ve noticed that parents of picky kids are somewhat defensive about it. 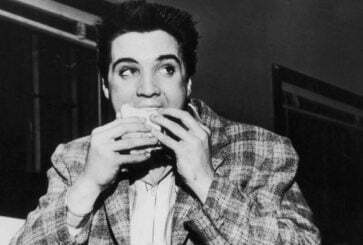 Nobody is harshing on your grilled pb&j just because they don’t want to make a separate meal for each kid when they can get them to eat normal dinner. I’m a ‘I’m not a restaurant’ mom, and I’ve adopted this philosophy because I don’t want my kids to grow up thinking the world will cater to their every whim. That said, I never force my kids to eat anything, and they can always opt to have fruit if they don’t like what is being served — which seems to happen daily in my 6 year-old’s case! Ro, you’ve done such a lovely job making your new house a home! It looks so warm and inviting and makes me wish we were pals enjoying a margarita together! Another lovely home! Ro, may I ask where you got your desk chair and bedroom wooden plant stand? Wow! I graduated from high school and went to college in Naperville, and this is the first time it’s ever seemed cool! Haha. Kidding! Sort of! Seriously, though, your house is so beautiful and cozy and it’s a great place to raise a family! Love your house, it’s decorated wonderfully! I especially love how you have a variety of items from places like Target and IKEA. A lot of the home tours on COJ are beautiful, yet furnished and styled with expensive items I can’t afford at this point in my life. Great to get some ideas and see a place I feel like I could afford to furnish! I’m a single mom who works full time. I cook, I enjoy doing so, my kid eats it, with me, at the SAME TIME, at the table. Not groundbreaking. I don’t think this ritual has stripped him of his identity. He gets to make lots of choices that are much more important. Ro, you have such a warm, lovely home that is appealing to the eyes and comforting to the soul. Thank you for sharing! I agree with both of the above comments – I don’t think it restricts their independence at all to make them eat what you give them! My kids eat what I’ve made, or they go to bed hungry – this has only happened once with each of them before they realised how crappy it is to go to bed hungry lol! I think it also teaches them that A) You’re the parent and you’re providing them with a meal that’s actually good for them, so you really do know what’s best and B) Roll with the punches. Try new things. Give it a go, you might like it! The “It’s OK” banner is not corny! I have one up in my bedroom and honestly, there have been days (with my own threenager and 1 year old) where those little words have kept me sane. It’s become something of a personal mantra. 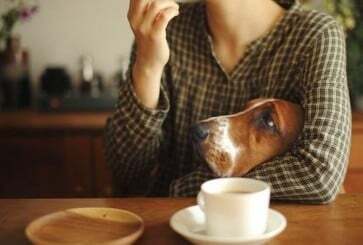 Always accompanied with a deep breath:) Your home is beautiful. Beautiful house and gorgeous family. Thank you for opening it up Ro. I love your approach to letting go of “stuff” and how reflective you are around what drove that. 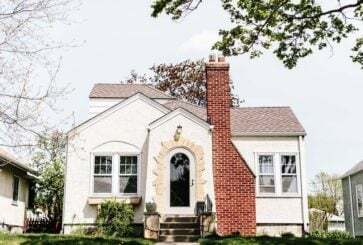 I’m in a NW city neighborhood in Chicago and am always looking for ideas to incorporate into our sweet little bungalow. 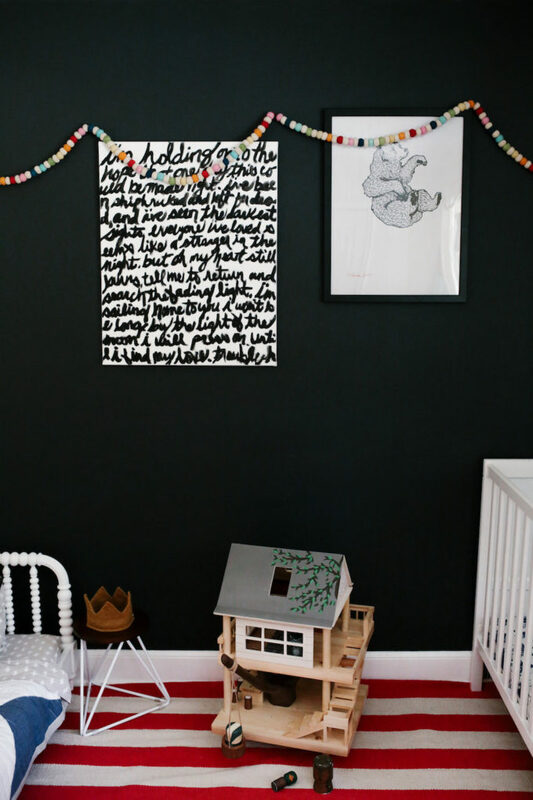 So curious about what looks like black painted text on white paper in the kids room! May I ask what it is, and if you made it or where you got it? I grew up in Naperville!! So exciting to see this tour. Also great to see a home with character — there’s a lot of new construction. Thanks for sharing! I love those dining room chairs! Any suggestions on where I can find them or something similar? Bummer! Thanks for the reply! three-nager!!! oh my gosh, so funny. 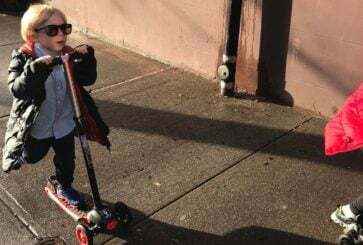 He better grow out of it, because you are the coolest, Ro! Lucky boys. What a lovely house tour! I was wondering if the photos on the fridge are polaroids put up with washi tape or something else? They look great! Also, would love to know the source of the pillow cases – are they also IKEA like the sheets? I was going to ask the same question, so thanks! Off I go to Target’s website. Love her decorating style. Just enough minimalism but looks lived in still. And we share wedding dates! 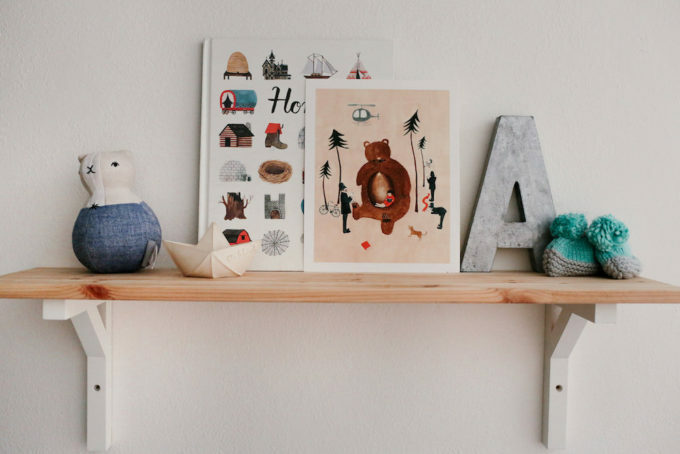 One question: Where is the shelf above the crib from? Thanks so much! Gotta love Target and IKEA :) They are equally amazing and dangerous!! This house is so cute! It is typical of the 1940’s houses with archways and beautiful hardwood floors, and for some reason, small kitchens. The house I grew up in was built in the late 40’s, but we didn’t have a fireplace, but there are the hardwood floors. Growing up in a small house, everything had a place. My mom has lived there ever since she and my dad were married, and after she was widowed, she stayed there. These older homes are well-built with features you can’t get today unless you have a totally custom built house. I really like the wall paper in the dining room. I enjoy this feature because I like to see how other folks live and decorate.